Laser Induced Breakdown Spectroscopy (LIBS) is an elemental analysis technique. LIBS makes it possible to analyse all types of materials regardless of their state (liquid, solid, gas or aerosol) and to perform simultaneous multi-elemental measurements that lead to qualitative and / or quantitative responses. LIBS is performed by focusing a pulsed laser on a material with the use a series of optical lens. Under the effect of the energy from the laser, the surface of the material is heated. 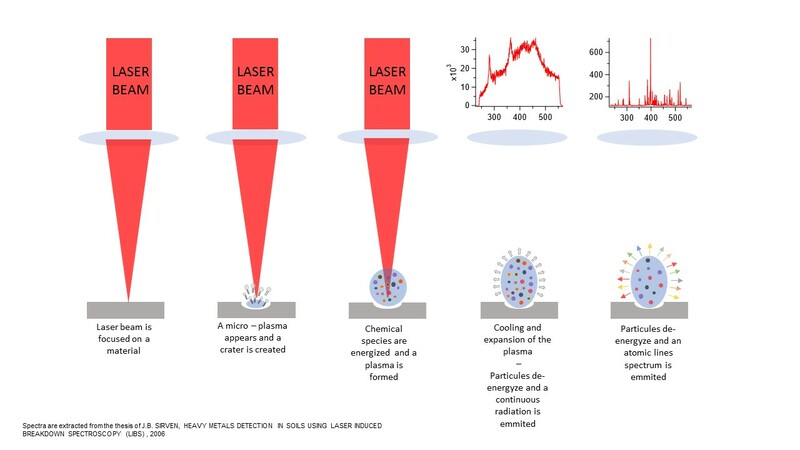 When the fluence (energy delivered per unit area) of the laser is greater than the ablation threshold of the material, it is transformed into vapour. This vapour interacts with the laser and ionizes. While still under the effect of the laser energy, this cloud of ionized vapour is transformed into a micro – plasma of several thousand Kelvin whose chemical species (electrons, atoms and ions) are in the excited state. The creation of this micro – plasma produces a shock wave that will eject the matter and creates a crater. The laser energy transforms the ejected particles in its axis into vapour while continuing to contribute to the excitation of the chemical species. The electron density of the plasma increases as does its size and its internal pressure. A series of physical reactions specific to the plasma then occurs, which makes it progressively opaque to the laser. The laser pulse ends and the plasma enters a phase of spatial expansion (under the influence of its internal pressure) during which it cools and its electron density decreases. During this cooling, the chemical species emit photons and de-energize which result in the appearance of continuous light radiation (black body type). As the electron density and the temperature of the plasma decrease, the intensity of this radiation continues to decrease in favour of the emission of a spectrum consisting of atomic lines whose wavelengths are characteristic of the constituent elements of the plasma thus of the analysed material. During the emission of photons, internal exchanges occur within the plasma resulting in re-combinations between chemical species including molecular re-combinations that may appear in the emission. The light radiation of the plasma is collected via an optical fibre connected to a spectrometer coupled to a detector. This light collection system makes it possible to record the emission spectra for a range usually from UV to IR (200 to 950 nm) depending on the spectrometer that is used. The LIBS analysis consists of interpreting the spectra from the plasma by identifying, using a database, the representative elements of the emission lines. The position of the emission lines indicates the nature of the elements present and their intensities are representative of the concentration of these elements in the plasma which means in the material being analysed. The processing of LIBS data is often considered complex because of the multitude of data present in a spectrum as well as because of the effects of matrices which are specific to emission analyses. The interpretation of the LIBS data is, however, facilitated by the use of a database allowing the automatic and / or manual identification of the emission lines present on a spectrum. The calculation of the concentrations, using the LIBS data, can be done via a monovariate approach (straight calibration or calibration curve) and / or multivariate (chemo metric models: neural network, least squares regression …). Obtaining optimal results is facilitated by a set of pre-treatments allowing the removal of collateral effects from emission spectroscopy such as interferences and matrix effects. It is also possible to compare the spectra by chemo metric models in order to visualize their similarities and their differences. The most common methods are the principal component analysis (PCA) and the K-nearest neighbours’ method (KNN). These approaches allow the correlation between spectra resulting from an analysis and reference spectra, and result via a human-machine interface in an automatic recognition of the material analysed by LIBS (example: Aluminium series 1000, series 2000 …). The LIBS data also make it possible to access so-called semi-quantitative information by comparison with a threshold or by real-time monitoring of the evolution of the signal. The LIBS technique has several significant advantages that allow to solve particular industrial problems. As mentioned above, the LIBS technique makes it possible to analyse all types of materials whatever their state (solid, liquid, gas or aerosol) but also their electrical nature (insulator or conductor). The LIBS technique requires little or no sample preparation which avoids the use of consumables and especially the use of aggressive chemicals. The analyses can be done in ambient air outside the laboratory. For specific analytical performances, certain gases such as argon, helium or nitrogen may be exceptionally used. LIBS instruments allow real-time analysis (sampling rate from a few seconds to ten minutes depending on the required analytical protocol). The LIBS technique has the optical ability to perform a remote analysis (from several meters away), which may be mandatory in hazardous environments (radioactivity, molten metal bath …). Similarly, the entire LIBS technique can be carried out by optical fibre in order to obtain a lightweight analysis probe (≈ 1.5 kg). It can be used over a radius of several meters around the instrument thus allowing analyses in areas that are not easily accessible. The LIBS instrument can also be installed on a production line. Its real-time direct analysis allow to keep track of a flow thus leading to continuous monitoring. The LIBS technique is a multi-elemental analysis method. An analysis makes it possible to obtain simultaneous information on all the elements of Mendeleev’s periodic table (light elements, transition metals, etc.). volume comprised between 1 μm3 and 105 μm3, depending on the analysed sample, which makes it a quasi-non-destructive analysis method. For the same reasons, this small interaction surface allows the analysis of inclusions and details of a material. The National Aeronautics and Space Administration (NASA) which, as part of the Mars Science Laboratory mission, equipped the Rover CURIOSITY with a LIBS “head” to remotely analyse Martian rocks. The Commissariat for Atomic Energy and Alternative Energies (CEA) in the field of nuclear safety. The Alsace Materials regional centre of Innovation and Technology transfer CRITT Alsace Materials) within the scope of material characterization analyses. As stated above, the LIBS technique allows for rapid analyses and does not require sample preparation. Depending on the analytical protocol, the user can achieve elementary detection to the limits of the order of one part per million (ppm). These detection limits can vary according to the instrument, the material analysed and/or the chosen analytical protocol. In addition, depending on the chosen usage mode, it is possible to perform stratigraphic analyses of a material (layer-to-layer analysis) in order to follow the distribution of elements within a material. The possibility of performing cleaning shots also allows representative analysis of a fouled or altered material. The ability to apply pre-treatments of one’s choice and an assortment of statistical approaches make it possible to obtain the desired interpretation of the results according to the analytical problematic. The ergonomics and automation of the man-machine interface allow both expert use (R & D problems) and routine use by an operator (process control). The small size of interaction between the laser and the material (25 μm to 250 μm radius) allows accurate analyses including inclusions or details. A set of self-monitoring and of data tracking as well as a control chart module allow quality monitoring of the results over time.